Italian Prime Minister Giuseppe Conte has put tenders on hold for a high-speed railway to France following political clashes over the project. The multibillion-euro TAV (Treno Alta Velocità) link has been criticised by the Five Star Movement, the biggest ruling party, but is backed by its coalition partner, the League. The impasse has raised talk of a government shutdown in Italy. It comes amid diplomatic tensions with France over immigration. The TAV is a joint venture between Italy and France aiming to link Turin and Lyon via a 58km (36-mile) tunnel through the Alps. It is expected to halve the travel time between the two cities to just two hours. The tunnel would also make it possible to travel from Paris to Milan in around four hours, down from nearly seven. The project was launched 20 years ago and part of it has already been dug. It is scheduled for completion in 2025. Costs were initially projected to hit €8.6bn ($9.7bn; £7.4bn), but Italy's Transport Minister Danilo Toninelli - a Five Star member - has put the price tag at over €20 billion. The EU first pledged to fund up to 40% of the cost, Italy up to 35% and France up to 25%. But on Friday, France's Transport Minister Elisabeth Borne said the European Commission offered to increase its share to 50%, leaving France and Italy to cover 25% each. Why has there been opposition? The rail line has been a continual source of contention within Italian politics. Supporters argue that it would take millions of cars and lorries off the road and drastically cut greenhouse gas emissions in the region. But opponents say costs will be too high and the money would be better spent on upgrading existing roads and bridges. An Italian government report last month concluded that the tunnel would be "very negatively profitable" and lose €7bn by 2059. But the methodology of its findings has been criticised. Image caption Deputy Prime Minister Luigi Di Maio and his party, Five Star, argue that money for the tunnel would be better spent on upgrading existing roads and bridges. Tensions escalated on Thursday after Deputy Prime Minister Matteo Salvini - a member of the League - told television station Rete4 that he would continue to serve in the government coalition "unless there are too many 'noes'" over the tunnel and other infrastructure projects. Five Star leader and fellow Deputy Prime Minister Luigi Di Maio later hit back at Mr Salvini and accused him of acting irresponsibly by pushing for the tunnel. On Saturday, Mr Di Maio attempted to quell concerns about a government shutdown, saying in a Facebook post that the dispute was "being resolved positively. So now let's talk about something else and move on." Mr Salvini also said in an interview with news channel Sky TG24 that "Italy needs a government ... there won't be a crisis." Telt, the Franco-Italian company running the project, says it plans to go ahead with tunnel construction on the French side to avoid losing millions in EU funding. But it said it but wouldn't do so without the consent of both countries. The firm also said it would be adding a clause in the tenders protecting it from financial penalties if plans for the tunnel are revoked. 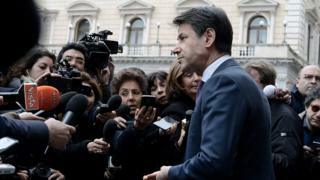 Italy is now expected to hold further talks over the project with France and the EU. An EU official told news agency Reuters the project could lose up to €300m of EU funding if tenders are not launched by the end of March.